The application is open until October 1, 2015. The newly built NA62 experiment has started taking data at the end of 2014 and it is launching a major campaign to accumulate an unprecedented sample of charged kaon decays. The experiment is designed to measure the very rare K+ → π+ υ ῡ decay. The experiment features state-of-the-art calorimetry, tracking and particle identification. Now that this new facility is built, it is time to focus on which opportunities in addition to the stated goal of the experiment, can be addressed. 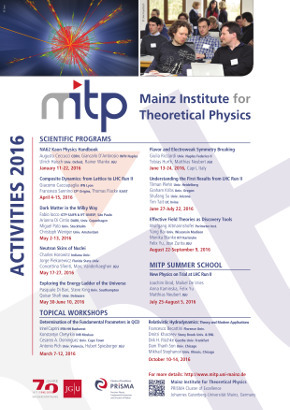 The suggested workshop aims to bring together the most renowned theoretical physicists which work in the field of kaon physics. Its main goal is the identification and discussion of open issues in the understanding of both the long and the short distance behaviour of kaon decays in view of the detection of or constraints on new physics beyond the Standard Model.